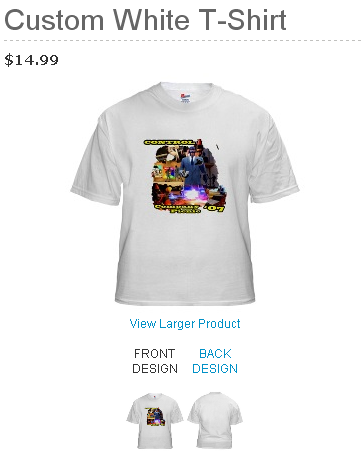 in an idea to make money for the clan, lets make some t shirts at one of those t shirt sites, I'm asking you guys for design ideas you think is fitting to the clan. one idea i had would be that Eak face of disappointment. Oh btw please post a picture of your idea. as long as its for the clan and not for ANY of your own needs, that sounds like a dandy plan. "PCJ: We Love a Good Circle Jerk"
One idea i had would be that Eak face of disappointment. 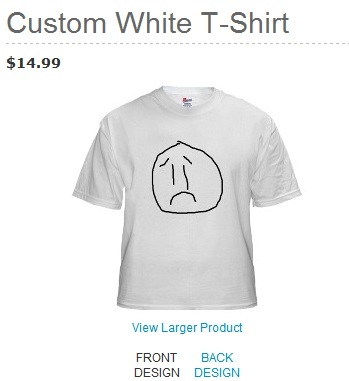 I'm not really sure why anyone would want a sad Eak on their shirt or their crotch, but let's give it a shot. it wouldn't make enough money to meet my needs, besides i already bought a new computer so yeah its all to the clan. O_O WELL I KNOW WHAT I'LL BE DOODLING TONIGHT. Try cafepress. I think they're one of the biggest custom things site. I think we should actually make some "actual" t shirts. Ones related to TF2. I was thinking maybe a silhouette of this would be SUPER NEATO. Also, the backstab kill icon. or Heavy firing + saying underneath - Fightin round the world. Back would have pcj or some tf2 related shite.